Every year, I seem to receive a book or two, merely on account of my serving as a rabbi, for which I am thankful to receive these books. 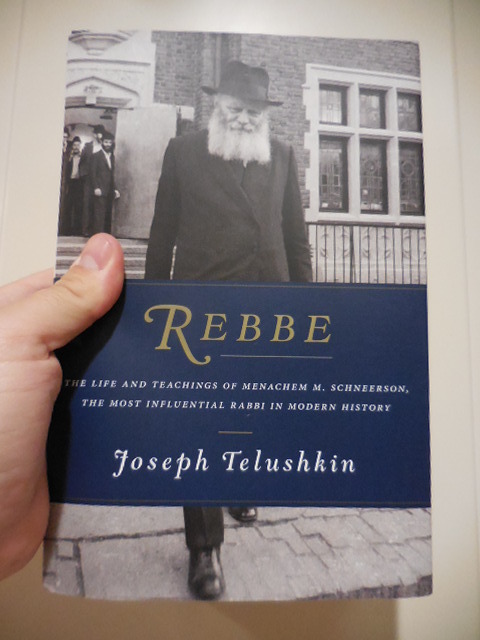 Last week, I received Joseph Telushkin’s Rebbe: The Life and Teachings of Menachem M. Schneerson, the Most Influential Rabbi in Modern History (New York: HarperWave, 2014), which has received a lot of attention, especially being one of a handful of books written in 2014, 20 years following the death of Rabbi Schneerson, the seventh Lubavitch rebbe. As anyone who is paying attention to the Jewish world knows, Lubavitch Hassidim have grown immensely as a Hassidic sect and are not only the most well-known Hassidic sect, but also a growing force on the Jewish scene. It is quite curious as to why that is. Although I began reading one of the foundational texts of Lubavitch Hassidim, תניא/לקוטי אמרים (and I plan to continue it this year) to better understand what makes them do what they do, it is also important to look at the man who has more recently propelled it across the world, the seventh rebbe, Rabbi Schneerson. So, I am excited to have a better insight as to his thought that has changed the landscape of Jewish life. In the preface, Rabbi Telushkin points out the personal impact of Rabbi Schneerson: “The Rebbe’s impact on my life has grown strong, and I suspect will grow stronger, in a whole host of spiritual, ethical, and ritual ways over the coming years. It is difficult to be exposed to the teachings of such a man and not be affected in some fundamental ways. I hope and expect that these impacts will long endure” (xiii). I am curious to learn not only about how his thoughts and action catapulted this movement, but also about the rebbe, himself.